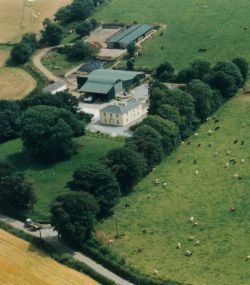 Ballymountain House, Innishannon, Near Kinsale, Co. Cork, Ireland. A warm welcome awaits you at this pre-1800 period county home on a dry stock working farm. Signposted on N71 at Innishannon Bridge. 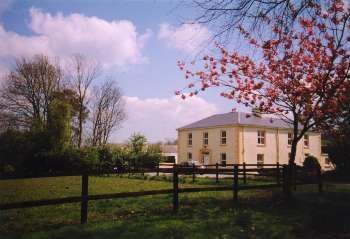 Convenient to Kinsale, Cork City, Blarney and many beaches. Also nicely situated for a day trip to west Cork and south Kerry. Golf Courses: at Bandon 18 hole, Kinsale 9 and 18 hole, Old Head of Kinsale 18 hole. Riding, angling, tennis, pitch and putt all within easy drive. Convenient to airport and ferry port. 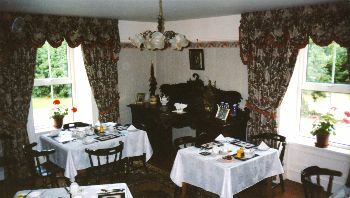 Early breakfast available. Recommended in many travel guides including Frommer's and RAC. Guests are welcome to bring own wine. Children welcome. Recommended by: Irish Sunday Independent Travel.